A 355-page book on troubleshooting, much of it relating to computer systems, could be a tough slog. 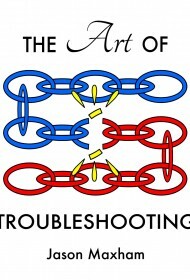 But with The Art of Troubleshooting, Jason Maxham delivers an informative and enjoyable manual. Maxham comes to the project with a diverse background; he has been an aviator, programmer, ham radio operator, motorcyclist and singer. From his days heading a software startup, he learned to deal with the inevitable problems that arose and now aims to convey what he learned, in general terms, as it applies across fields and industries. Maxham is a straightforward writer who is careful not to get overly technical and lose readers. “I want to put you back in control by giving you the tools and mindset needed to have a healthy and productive relationship with the machines in your world,” he writes. Those machines can be computers, cars, oil refineries or machines that glaze doughnuts. In achieving this goal, Maxham consulted with a variety of experts – people in the fields of medicine, mechanics, programming, HVAC and information technology – to find out how they approach and solve problems. He examines every aspect of troubleshooting – from having the right tools and isolating problems to making decisions about repair vs. replace, post-solution analysis and more. Even if you’re not dealing with an assembly line that inexplicably shreds your teddy bears, there are lessons here. The author uses dozens of photos to complement his lessons. For a section on skepticism, for example, he includes a shot of a highway sign: “Welcome to Missouri/The Show-Me State.” Talking about the need to be logical and systematic, he offers a photo of Leonard Nimoy, Spock in Star Trek. Every photo makes a point, generally with humor. It’s a small thing, but another indication of the author’s thoroughness – and his nice touch. We all encounter problems daily. This book may not solve them, but it will introduce readers to the smart way to approach and analyze the challenges they face.